This video was shot during the Coaching People To Train Their Dogs two week workshop at Legacy Canine Training and Behavior. The DVD is menu driven and begins with lecture to the Coaching Students on puppy headstart classes that include PowerPoint and video. 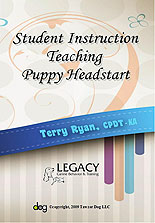 The twelve students then hold a class using the Terry Ryan's model for Puppy Headstart. After the training session, there is an Q & A regarding the class. This is followed by an actual class in session, with Terry Ryan as the instructor. Sit in on an actual class in session. This is not a seminar setting, but an actual working class. Puppy Headstart gives new puppies and their owners a chance to socialize and become accustom to other dogs and people. In addition, puppies are exposed to brief exercises to introduce them to new situations. Visit the classes in session and see how a puppy headstart works with live video of owners and their dogs.